my wife and I live in the Sierras about an hour from Reno, NV in Northern CA. 10 yrs. ago we quit our jobs and lived in a small travel trailer while we built our home. We live at about 5,400' and get a lot of sun for the majority of the year. We bermed our home into the side of a gradual hill with a southern exposure. The north wall is all concrete with no windows. We insulated the concrete wall with 4" of rigid extruded polystyrene, which goes down to the footings. The southern exposure is primarily low e windows. 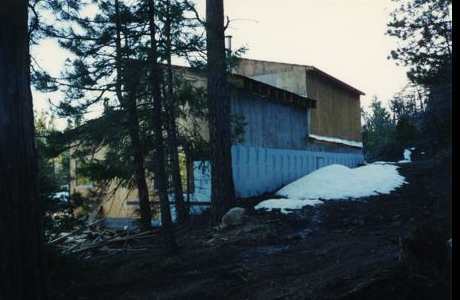 We built on a concrete slab and insulated around the perimeter of the foundation with 4" of the same rigid insulation. Needless to say we have a lot of thermal mass. We normally use about 2 cords of wood a year to heat our home. We don't require any cooling in the summer in spite of occasional 90-95 degree days. We do sometimes have a small overheating problem in Sept. as the sun penetrates into the house because the sun is lower in the sky and it sometimes remains hot in Sept. We have about 900 watts of photovoltaics along with an inverter and deep cycle batteries. We broke down and paid for the extension of the grid to our home as we got tired of dealing with a generator during prolonged cloudy spells. I must admit I am glad to not have to deal with the generator. If there's anything you would like to know.... feel free to ask. It took us about 14- 18 months to get far enough along to be able to move into the house..... even though it wasn't really done......... the travel trailer got old....... especially in the winter. Much more detail on the design and construction below. Thanks very much to Gary for providing this great story and the construction/design detail! 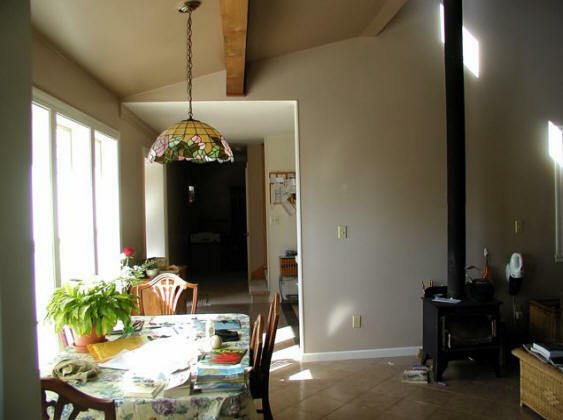 I decided to incorporate a lot of thermal mass to hold any heat generated in the house. It also helps prevent temperature swings which has always bothered me in forced air houses. 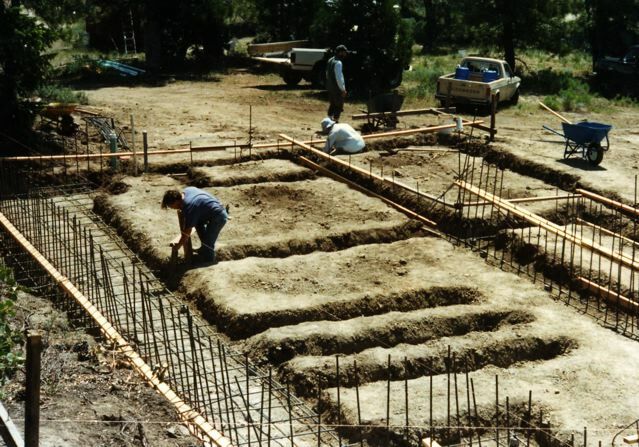 The footings required about 32 yards of concrete. Part of the reason for this was the fact that the north wall, bermed into a hillside, is almost all concrete. This required a much larger than normal footing. We only had three people to handle the concrete pour for the foundation (footings). We didn't have a concrete pumper which meant a lot of wheelbarrowing to get the concrete where it needed to be. If we would have had concrete truck access to the other sides of the house it would have been much easier. Concrete pumpers cost a lot more money so we decided to do without. I don't think much of the concrete work would have ever happened if it wasn't for a friend who very generously came up many times and taught/helped us learn how to use a transit, rebar, and concrete form construction. The amount of time and money for the concrete work was much, I repeat, much more than I anticipated. Of course, I didn't really know much. It took about a month and a half to finish the concrete work which included the concrete walls. I also put an attached greenhouse, of sorts, on the south side of the house. We poured a foot thick concrete wall as the north common wall to the rest of the house. It took two mats of rebar because of the thickness. We hired a contractor to do the concrete slab that the 1st floor rests on. We were leery of attempting that as 1200 sq ' of concrete sets up much faster than what we could deal with. 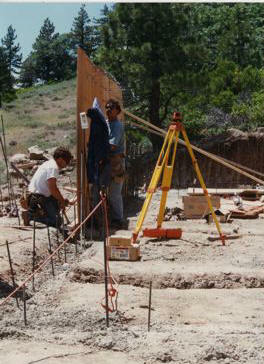 The second pour, north and partial east and west walls, was also about 32 yards. of concrete. We had to hire a concrete pumper as the forms were between 8 and 13 feet high. About 7 friends came for this pour. It was a little hectic trying to level off the tops of the pours and placing anchor bolts for the mud sills. We used 4" of extruded polystyrene on the outside of the concrete walls down to the footings. I've seen the insulated cement blocks for home walls...... it seems you don't have the advantage of the concrete's thermal mass for heat and cooling retention as the concrete blocks are not insulated on just one side. I can't tell you how much more comfortable our home is with the availability of all that thermal mass. We chose to insulate around the circumference of the stem wall, in the framed part of the house, rather than under the concrete slab. We used extruded polystyrene from the footing to the top of the stem walls. We applied the polystyrene on the inside of the stem walls rather than on the outside as we had done on the concrete walls. 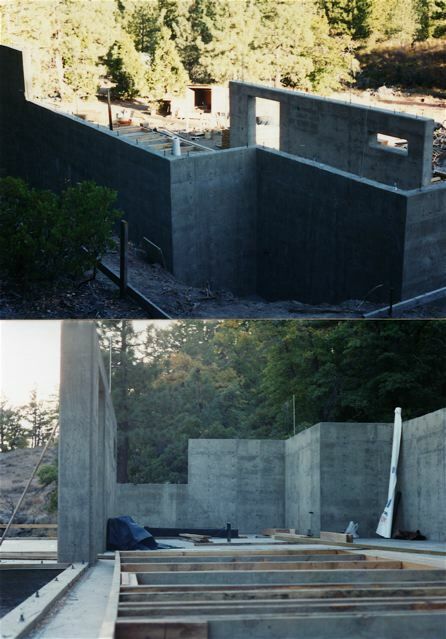 For the north, east, and west sides of the house we water proofed the below grade concrete with the Bituthene 3000 system. We put French drains at the junction of the footings/walls with a polyethylene sock covering them. We also put a membrane on the outside of the the bituthene that is supposed to eliminate hydrostatic build up. It seemed a good idea to do whatever possible to prevent any kind of water leakage into the house. 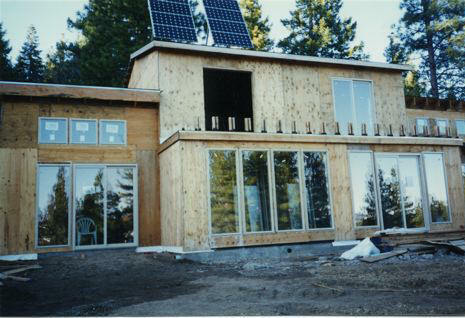 My guide for glazing to thermal mass to house volume ratios was derived from Edward Mazria's book, The Passive Solar Energy Book. I thought the book was excellent, although I've heard it is out of print. You might be able to get it used. 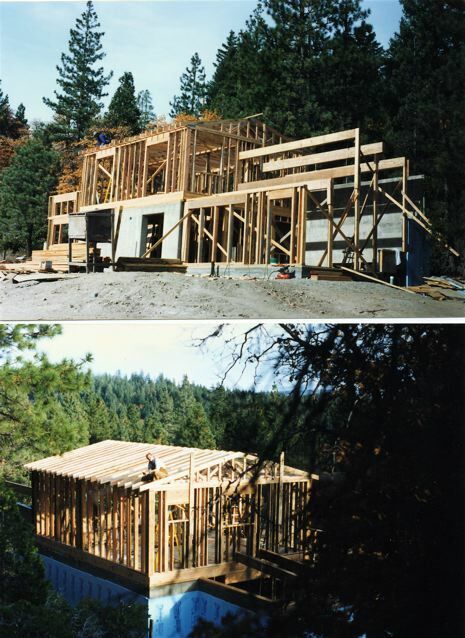 The framing aspect of the house was relatively conventional. The 2nd story is completely wood framed, but the fellow who drew the plans thought that r-30 would be more appropriate for the north wall as it's exposed to cooler temperatures. It's basically a 2x6 wall combined with a 2x4 wall. 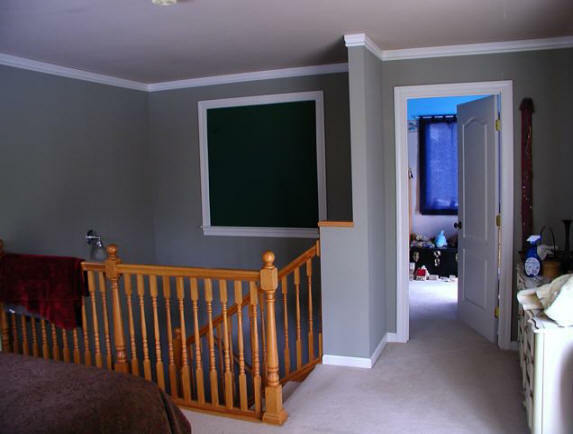 We used Hardi Plank for siding on the south, east, and west walls. It's cement combined with a few other products and seems to be holding up really well. It holds paint well. We used a circular saw with a carbide blade to cut it. It doesn't look as "pretty" as natural wood siding but there's no maintenance. 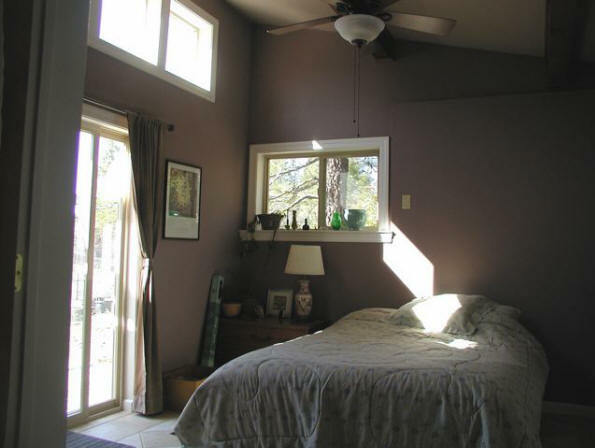 We chose mostly fixed low-e themal pane windows for the south side of the house. The sliding glass doors are of the same build. I got the cheapest windows I could find and have lived to regret it. I didn't really pay attention to the warranty. The warranty was 7 yrs and after 8 yrs. we are seeing infiltration on many of the south side windows. By infiltration I mean that you can see condensation in between the two panes of glass........ the seal has been compromised. One window, from the same manufacturer, is about $400 now. 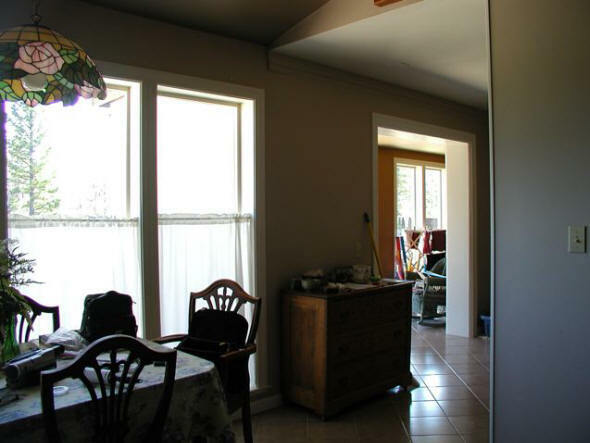 We have 10 fixed windows and 4 sliding glass doors that will have to be replaced...... so you can do the math. We were in a quandary as to what to do about covering all that rigid insulation over the concrete wall. The fellow who drew our plans had chicken wire and stucco as the finished outside wall. We decided to use traditional 4'x8' panels of siding. It took us awhile to figure out how to securely attach them to the outside of the polystyrene. We found a company that sold extra long concrete screws. We glued and screwed the siding on. The screws went through the rigid insulation and into the concrete. We mounted about 800 watts of solar modules on the roof. We have a Trace inverter and started with golf cart type batteries. We used a propane powered generator for back up power during some of the cloudy winter weather. After about 6 yrs we opted to connect to the grid. It seems we were always in the midst of large snow storms when we would experience generator problems. I'm not mechanically inclined so I like the idea of not having to deal with a generator. We have pretty reasonable electricity rates, it's a cooperative where we live. Our average bill for electricity is about $10-$20 a month. We do pay about $20 a month for a coop charge..... even if you don't use any electricity. We bought a Sunfrost refrigerator/freezer and that in conjunction with compact fluorescents and switched outlets for phantom loads have all proven to be good ideas. We don't have solar water heating....... it's something I'd like to do. I'm adverse to the solar water heating system you have to use in cold winter weather climates ( antifreeze and heat exchanger ). Batch type solar water heating is something I might use in the near future and just drain it in the autumn. We replaced our Trojan golf cart type batteries, after 7 yrs, with Trojan Deep Cycle batteries. The golf cart type batteries were projected to last 3-5 yrs. I don't know how to account for the added longevity. I didn't do anything special...... just watered them periodically..... and never ran them down more than 60% of their capacity. Our home is about 1800 sq. ft. Our heating requirements are about 2 cords of wood a year. We use no other sources of heat, other than the sun. 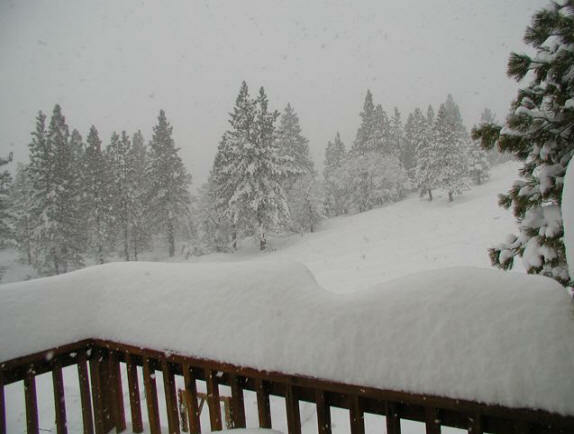 We live at about 5400' elevation and have a temperate winter climate. We rarely have below zero temperatures, but it does normally get into the teens or, on occasion, into the single digits. The summer temps sometimes get into the mid nineties. We have no need of any additional cooling, although it sometimes gets up to 78 degrees, in our home, in Sept. if the temperature outside gets into the nineties. The reason for that is...... the south side eave length is a tradeoff. We could have made them longer, to prevent the sun from penetrating into the house in Sept., but that would have prevented the sun from heating our home on colder days in Sept.
We use propane for hot water heating and cooking. My wife did almost all of the finish work. She has a lot of patience and that definitely lends itself to finish work. I don't mean to gloss over how much thought and energy was required to do the finishing. 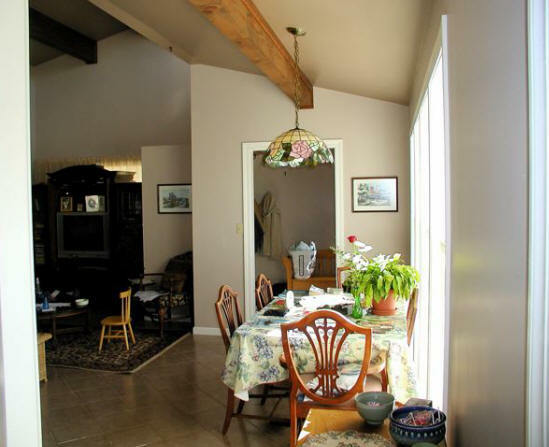 Ceramic floor coverings, kitchen cabinets, ceramic counter tops, window and door trim, etc. were all things she did on her own. A neighbor helped us cut and hang the sheet rock. My in-laws came up periodically and helped us with miscellaneous things. Although there were times of anxiety and confusion I have to say that it was a great experience. In retrospect...... I can't believe we did it. I am sometimes confronted with daunting tasks, since building our home, and I always have this adventure to look back on to put things into perspective. I hope that stories like this will inspire people, collectively, to do the things necessary to make our communities sustainable. The task seems overwhelming when looked at in total. We just need to address one task at a time.